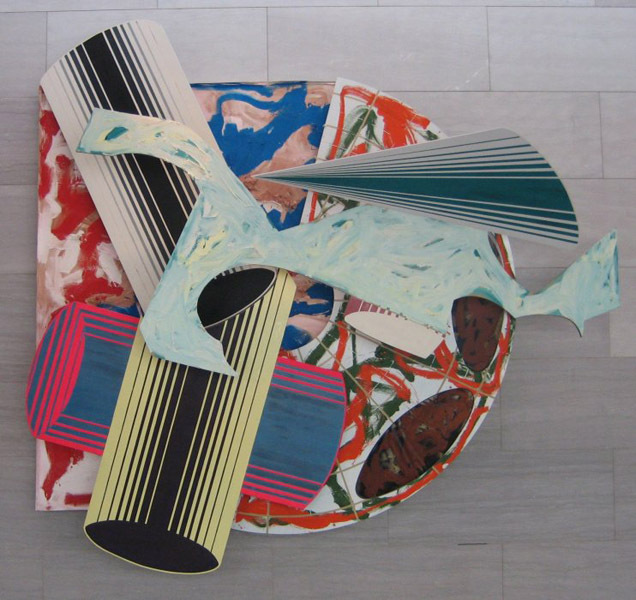 This is part 1 of a 3-part post on the works of American artist Frank Stella. His output over the years has been so diverse that it needs three posts to fully appreciate the breadth of his work. I am a big fan of his later work, that will turn up in part three. Part one here, is an overview of Stella's varied output over the years. Parts two and three will look at both older works and more recent works by him. 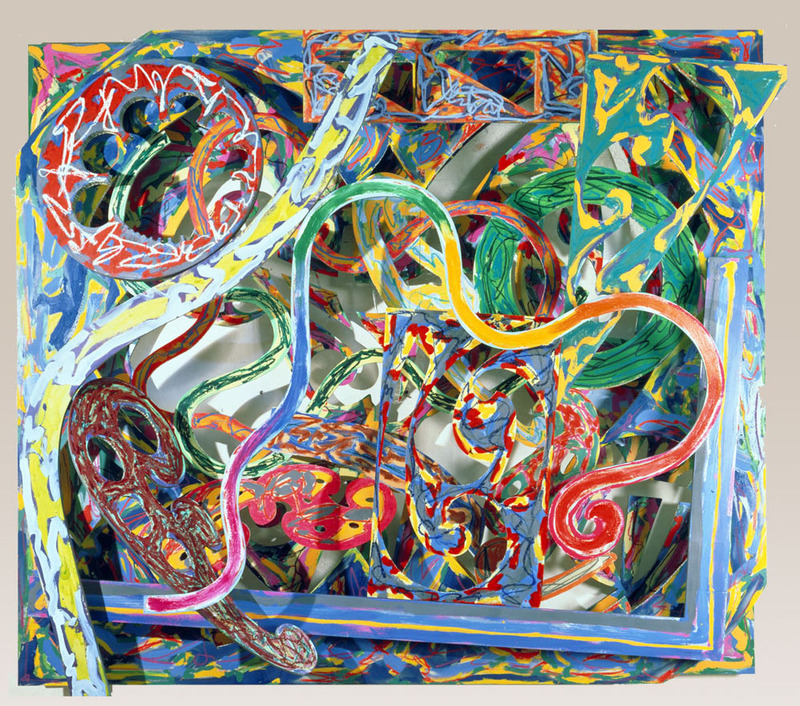 Frank Stella was born in 1936 in Malden, Massachusetts. In 1950 Stella entered the Phillips Academy, Andover, MA, where he studied art history and painting; it was here that he realized that he had no interest in representational painting. Stella continued his studies in history at Princeton University (BA, 1958). At this time he was painting loose, gestural abstractions in the tradition of the New York School. He was already highly regarded by his professors, yet he did not seriously entertain the idea of a career in the arts. He kept in touch with developments in New York and in 1958 he saw Jasper Johns’s first one-man exhibition. 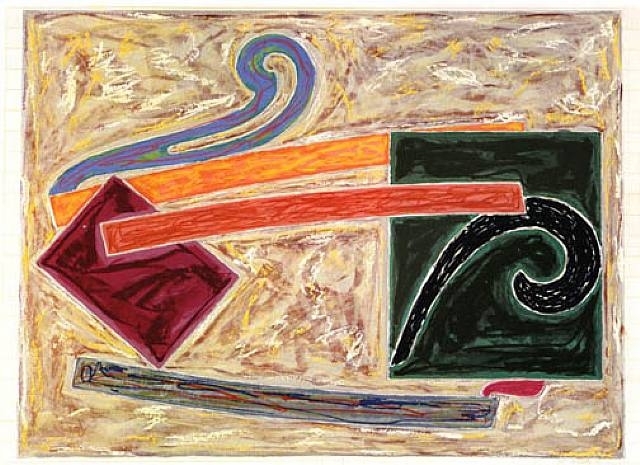 Johns’s canvases, although painted with the visible brushmarks of Abstract Expressionism, were just what they appeared to be: flags and targets. Stella was impressed not only by this factuality, which later motivated him to say of his own work, ‘What you see is what you see’, but also by the geometric patterns of rings and stripes that formed the images. After graduation Stella moved to New York with the intention of staying there to paint for the summer only. When he was not drafted into the army as he had expected, he took up painting seriously. After two essentially accidental, transitional paintings, for the next 16 months he pencilled lines on raw canvases, partially filling in the open spaces with black house-paint. The process left stripes that appeared to have uncertain parameters between the pencilled lines. 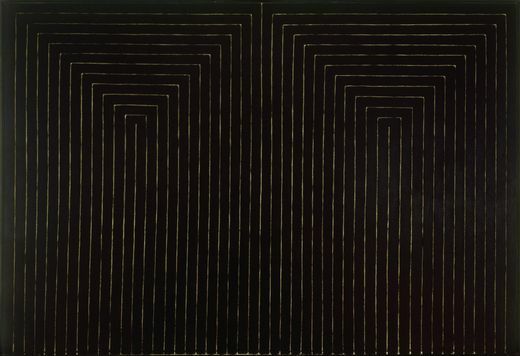 They became known as The Black Paintings, and four were first shown in 16 Americans (1959–60) at the Museum of Modern Art, the exhibition from which the museum purchased Marriage of Reason and Squalor. From that time Stella consistently developed his increasingly complex variations on selected themes in a highly organised, cyclical manner that for many years allowed little room for spontaneity. 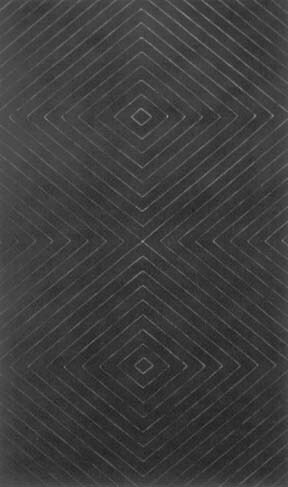 In 1960 he held his first one-man show in New York, at the Leo Castelli Gallery, exhibiting striped canvases called the Aluminium Paintings that extended the explorations of The Black Paintings. 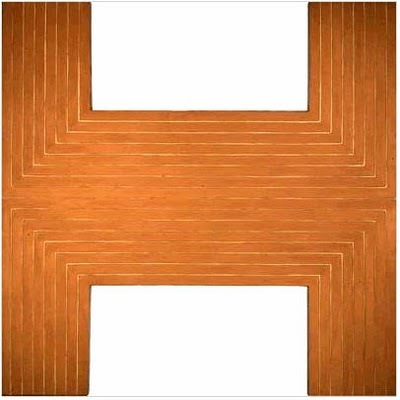 The Copper Paintings of 1960–61 included more elaborately shaped canvases, which conformed to the increasingly eccentric stripe configurations. 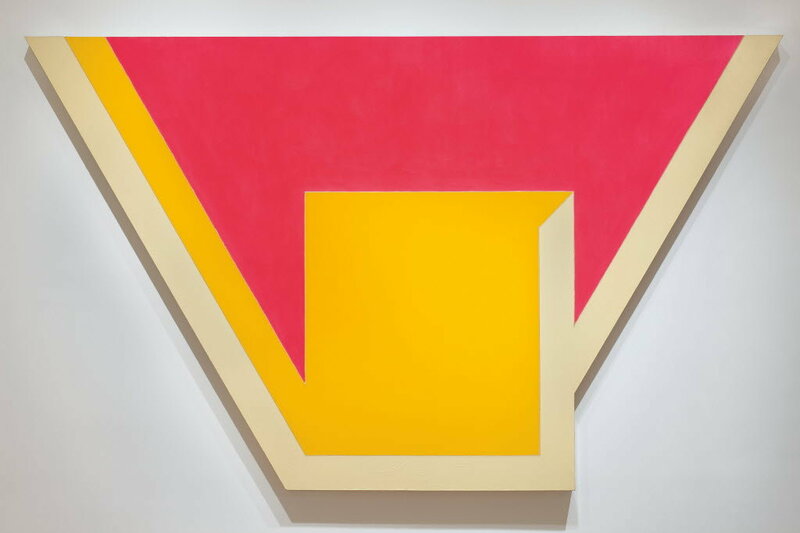 The first radical shift in Stella’s work came in 1966–7, with the Irregular Polygon series. 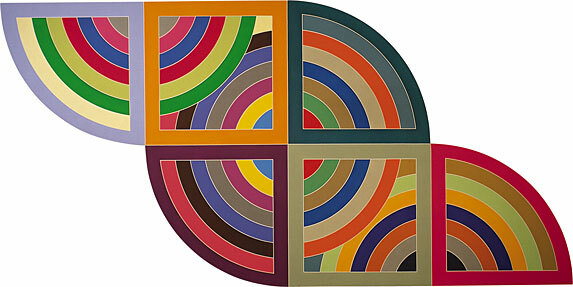 Employing interlocking geometric shapes bordered by the familiar bands, Stella uncharacteristically allowed for large, central fields of colour. 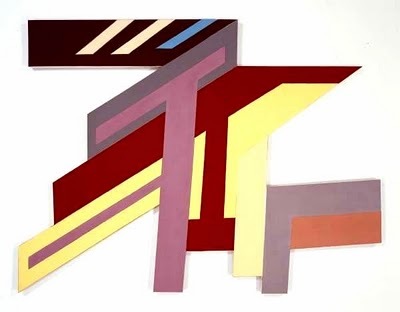 During the summer of 1967, he temporarily set aside the implications of the Irregular Polygons to produce one of his most extraordinary series of band paintings devoted to relationships of colour, form and pattern. The Protractor series (1967–9, with additional works until 1971) is characterised by monumental scale, potentially garish colour juxtapositions and, for the first time, curvilinear forms derived from the drawing tools referred to in the title. 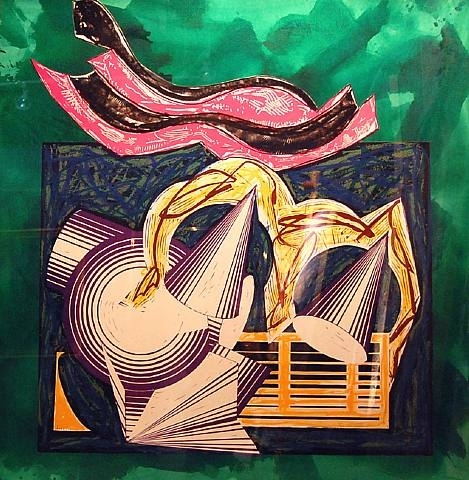 Stella began his extended engagement with printmaking in the mid-1960s, working first with master printer Kenneth Tyler at Gemini G.E.L. Today, of Stella’s 250+ print projects to date, 60% has been made in partnership with Tyler. Prints offered Stella the chance to rework certain concepts. This feature was a hook that kept him interested in the medium for decades. 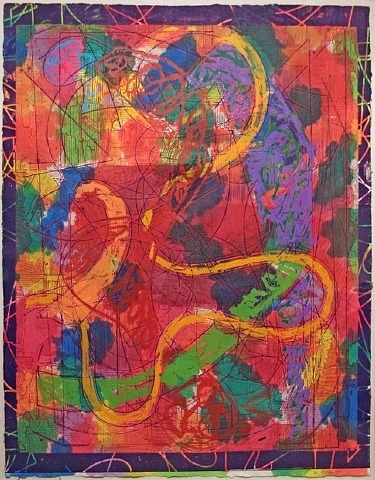 Stella’s advances of the 1970s were precipitated, in part, by a lengthy hospital stay during which he began the drawings for what would become the Polish Village series (1971–3), and, perhaps, by the opportunity to reflect on his development as outlined in his 1970 retrospective exhibition at the Museum of Modern Art. Conceived as approximately three versions each of 40 designs, the Polish Village works build upon the constructive geometry of the Irregular Polygons, but in the form of collages, extended first to collaged bas-reliefs and then to collage constructions forming interlocking planes in high relief. Named after a series of 17th-, 18th- and 19th-century wooden synagogues destroyed by the Nazis, they signalled Stella’s growing interest in Jewish themes and in contemporary links to Cubism and Constructivism. 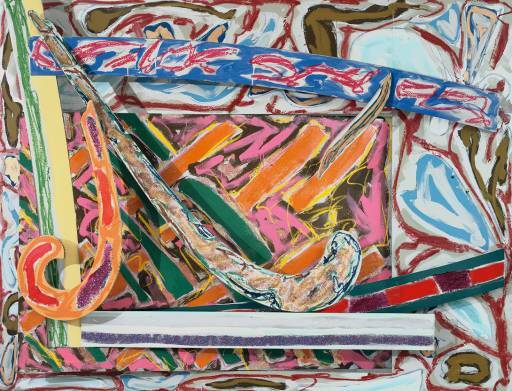 But the passage of thirty-some years encompasses changes in more than just Stella's art-making. We now stand thirty years further from the grainy images that first set Stella off on his imagined excursion into Polish villages: photos of the wooden synagogues of Poland, already long gone by the time they were published in 1957, not to mention by the time the book Wooden Synagogues found its way into Stella's hands some years later. What in 1957 was still a vivid memory, and by the early 1970s an obscure reference, is today at least two generations removed from living experience. Later regarded as transitional in both style and technique, the Polish Village variations, as a whole, prepared the way for more than a decade of increasingly assertive and often wildly eccentric reliefs that would leap from the wall and occupy enormous portions of the viewer’s space. 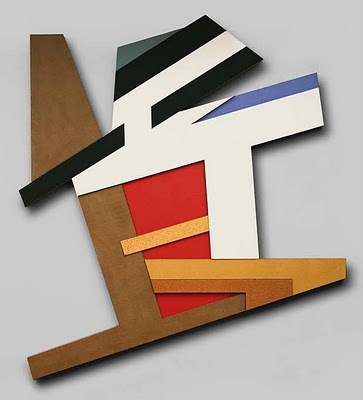 The Brazilian series (1974–5) was followed by the Exotic Bird series (1976–80), aluminium reliefs whose obtrusive shapes were derived from templates of drafting tools. These two groups and the subsequent Indian Bird series (1977–9) progressively raised the issue of Stella as a sculptor, but he insisted that the wall remained the support, that these works were to be seen from the front, and that the pictorial problems and solutions were concerned with the ‘fullness’ and ‘mobility’ of pictorial space. The metal elements that extend from the wall lose any severely planar quality in the presence of agitated, abstract, graffiti-like painting that covers and disguises the architectonic relationships of the surfaces. 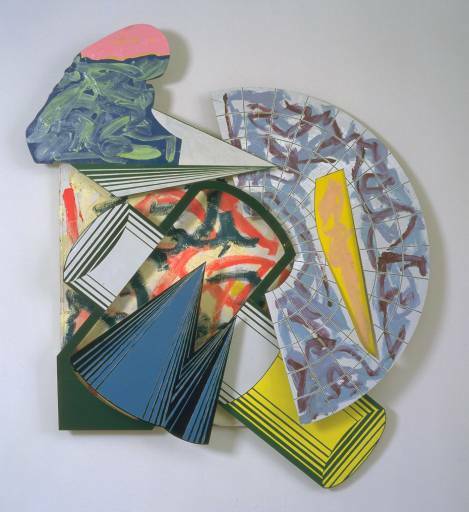 Stella’s development of an increasingly baroque idiom in the Circuit series (1980–84) and in the South African Mine series (1982) was distinguished by an expanded vocabulary of materials and forms and by extremes of pictorial and actual space. Stella’s printmaking developed alongside his painting, and his print series were often named after paintings exploring similar themes. From 1967 he used lithography, screenprinting, intaglio and relief printing, often combining them in complex mixed medium prints. 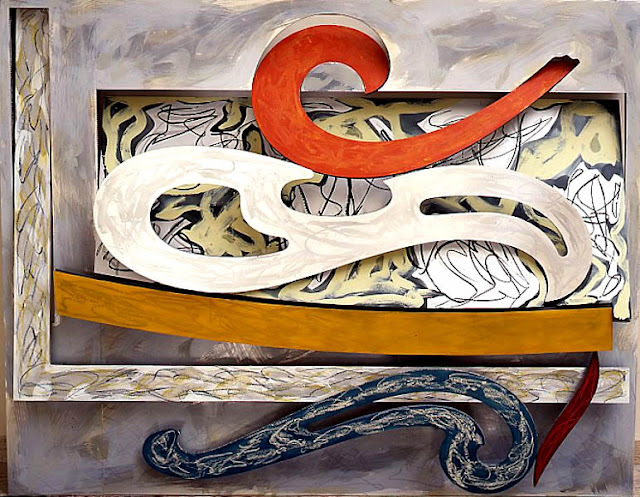 The Circuits series created simultaneously with the paintings of the same titles, extended the iconography of the racing theme first referred to in the Aluminium Paintings series. In these he employed etching, wood blocks and engraved elements to create an unusual mixture of intaglio and relief. 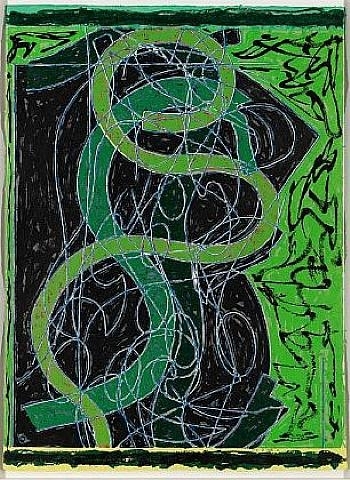 In 1975 he made 183 hand-painted and collaged reliefs of cotton-pulp paper in small editions. 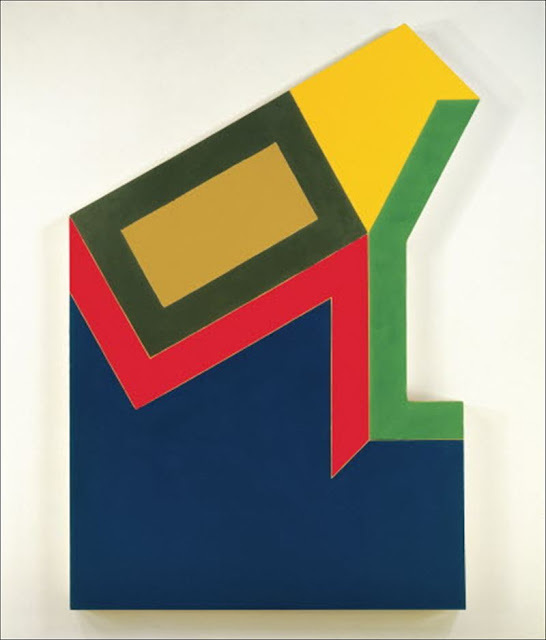 Stella’s attitudes and aesthetic direction during the 1980s were no doubt codified by his residency at the American Academy in Rome (1982–3). The time was to be spent studying Italian painting and the result was his discovery of the spatial assaults of Caravaggio, Rubens, Rembrandt and Velázquez. In 1983 Stella was named Charles Eliot Norton Professor of Poetry at Harvard University (1983–4). The award required the recipient to give six lectures; in them he stressed the possibilities both for abstraction and specifically for his own art suggested by the dramatic illusionism of Baroque pictorial space. The lectures, published as Working Space (1986), provide a key to works such as the Cones and Pillars series. 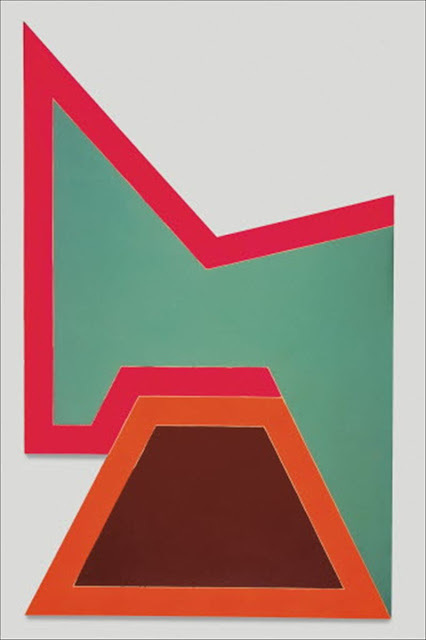 This and other reliefs composed of illusionistically detailed cones and other architectural or geometric elements set the stage for the increasingly multi-dimensional, hybrid painting/constructions of the late 1980s and early 1990s that evidenced his keen awareness of aspects of the work of Picasso and Kandinsky he had cited in Working Space. In the 1990s he became involved in public art projects, architecture and, most notably, the complex design of a new theatre in Toronto, marrying painting, sculpture, architecture and murals on a grand scale. 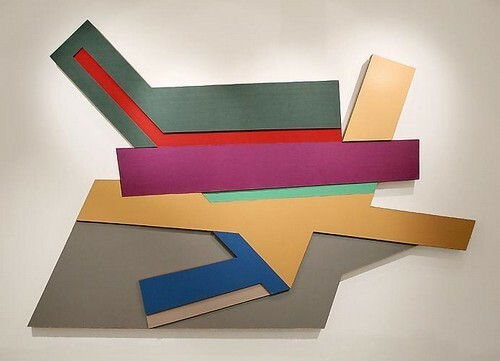 In the 1990s, Stella began making freestanding sculpture for public spaces and developing architectural projects. In 1992–93, for example, he created the entire decorative scheme for Toronto’s Princess of Wales Theatre, which includes a 10,000-square-foot mural. His 1993 proposal for a kunsthalle (arts center) and garden in Dresden did not come to fruition. His aluminium bandshell, inspired by a folding hat from Brazil, was built in downtown Miami in 1999. In 2001, a monumental Stella sculpture was installed outside the National Gallery of Art in Washington, D.C.